Streetscaping aims to improve walkability in Troy. Photo by David Lewisnki. Downtown Wixom. Photo by David Lewinski. Downtown Auburn Hills. Photo by David Lewinski. When one thinks of downtowns in Metro Detroit, the cities of Ferndale, Royal Oak, or Birmingham may immediately come to mind. This is probably due to those areas having a traditional downtown, in which there is the main street is lined with bars, restaurants, and quaint shops that attract residents and visitors alike. However, several communities without such intact historic centers are hoping their commercial areas will become the next downtown destinations for Metro Detroiters. 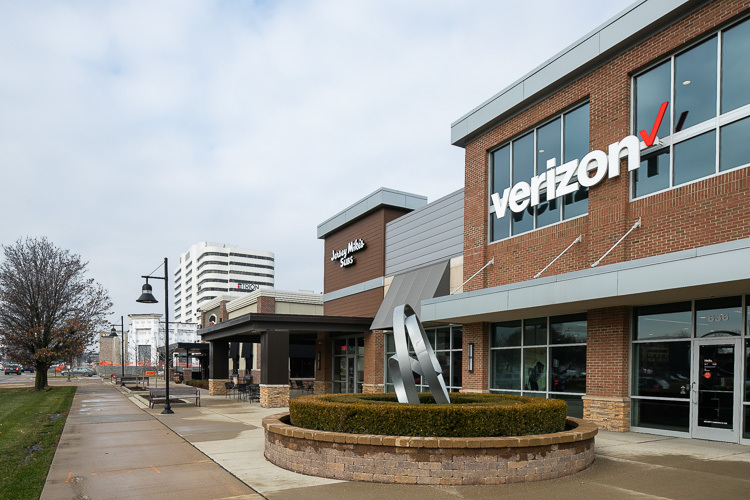 Metromode takes a look at how three Oakland County cities--Auburn Hills, Troy, and Wixom--are creating initiatives to develop more business and housing opportunities, as well as walkability those who want to live and work in these downtown areas. Compared to other cities in Metro Detroit, Auburn Hills is still relatively young. While starting out as the village of Auburn in the early 1800s, Auburn Hills did not officially become a city until 1983. Since then, the community has become known as a business and college hub, as the headquarters for Fiat Chrysler Automobiles is located in the city, as well as higher education institutions: Oakland University, Baker College, Oakland County Community College, and Cooley Law School. Auburn Hills’ downtown, which is located at Auburn and Squirrel roads, has also been developing. According to the city's website, the area was revitalized in 2002, with the city and the Tax Increment Finance Authority investing over $18 million in infrastructure and streetscape improvements. In recent years, city officials have developed spaces to accommodate the more than 23,000 students in the community such as the Auburn Square Apartments and parking deck, as well as study space The Den. Now, Auburn Hills is focused on developing housing in the area, with over $86 million dedicated to residential investment in the past few years, says Stephanie Carroll, manager of business development and community relations. Late last year, the city broke ground on four housing complexes; Primary Place, Riverside Townes, Residences at Thirty-Two Fifty, and Midwest Innovation Lofts (The MiL). While Primary Place and Riverside Townes are condo and townhome projects, Residences and The MiL will be mixed-use spaces. According to Developing Thoughts, the city’s former blog, Residences will be located on the corner of Auburn and Squirrel, consisting of a four-story building with 3,900 square feet of commercial space on the first floor and 48 apartments on the three remaining floors. The MiL will also be on Auburn Road, with the building housing a restaurant on the ground floor, office space on the second and third floors, and six loft-style apartments on the fourth floor. The office spaces will be geared towards automotive, medical, education, and design professionals, with developer Designhaus Architecture to move its corporate offices onto the third floor. The lofts will be catered towards new professionals. All four projects are expected to be completed in the next year or two. In addition to building new housing downtown, a new amphitheater and splash pad is expected to open next May in Riverside Park. According to the Oakland Press, the project will consist of 300 seats and 200 lawn seats, a 950 square-foot dance floor, and a play area. Kevin McDaniel. Photo by David Lewinski. Like Auburn Hills, Troy does not have a traditional downtown. Planning Director Brent Savidant says the city is making up for that by building an "economic corridor," where business offices, retail, and restaurants are all in one centralized area. Troy is doing just that with the Big Beaver Corridor. According to the city website, the study was commissioned in 2007 by the Troy City Council and the DDA as a way to build development on the major road and secure Troy’s place as a regional economic player. The goals of the Big Beaver Corridor include offering redevelopment opportunities, transforming Big Beaver into a 24-hour destination, and creating a roadway that is safe for pedestrians. The corridor runs east just after Big Beaver and Rochester roads to west just after Big Beaver and Coolidge Highway. The commercial road has since become one of Troy’s busiest areas, with attractions such as the Somerset Collection, and a host of bars and restaurants including P.F. Chang’s, Morton’s Steakhouse, and the Bonefish Grill. 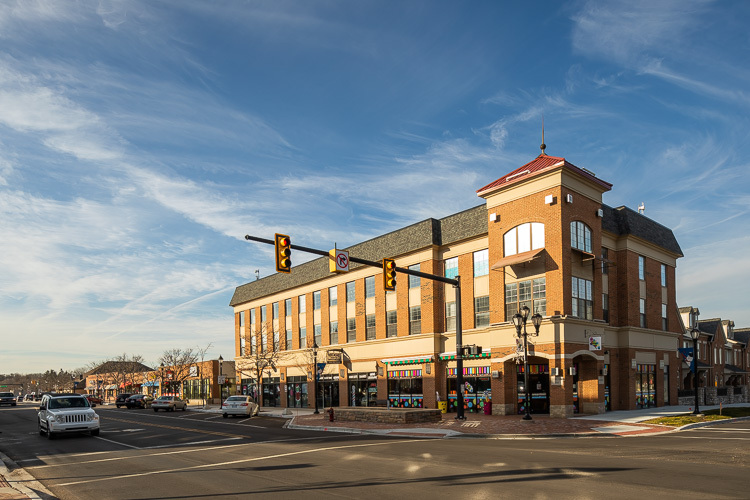 Big Beaver has also become a business district, with Fortune 500 companies such as PNC Bank, Flagstar Bank, and Kelly Services opening offices on the street. 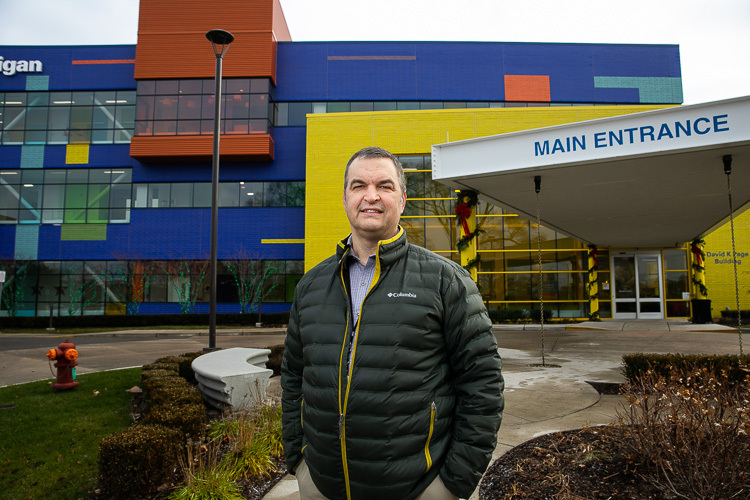 Medical institutions are moving into the area as well, with the Children’s Hospital of Michigan-Troy opening in 2016. Brent Savidant. Photo by David Lewinski. One of the first problems Savidant and the DDA recognized on Big Beaver was that there were too many surface parking lots that were underutilized. The Planning Department then came up with the idea to create more commercial spaces to replace some of the most vacant lots. The first project Savidant worked on was building restaurant Granite City Food and Brewery in front of the PNC Building in 2012. Another way Troy is promoting walkability is through its Move Across Troy initiative, which aims to improve pedestrian crossing in the city. In 2016, the city allocated $550,000 towards the program’s first project: constructing a crosswalk on Big Beaver just east of John R Rd. Nonprofit technology and manufacturing organization Automation Alley is located on the south side of the purposed crosswalk, while Troy Sports Center is located on the north end. The project is currently in development. Troy's Big Beaver Corridor is one of the city's busiest areas. Photo by David Lewinski. According to the city website, other objectives for the program include adding advanced crossing signals, trolley stops, and protection from the winter and summer elements. While activity has boomed on Big Beaver, the corridor is still growing. A new strip mall called City Center Shoppes is almost complete, says Savidant. The retail space is part of an extensive, mixed-use development on the site of the City Center Building located at Big Beaver and Crooks. Businesses have already opened in the complex, such as Shake Shack and a two-story Fidelity Investments building. Restaurants Seasons 52 opened on December 13 and Yard House on December 17. An eight-story parking deck and a 272-unit apartment building called Zen Apartments was approved by the Planning Commission earlier this year. According to the Troy Times, the building will consist of studio, one, two, and three bedroom apartments. Other features include a pool, exercise room, clubhouse, zen garden, business center, and a game room. The apartments and parking structure have not started construction. Starkly different from the hustle and bustle of Troy, Downtown Wixom has a quiet, small-town feel. 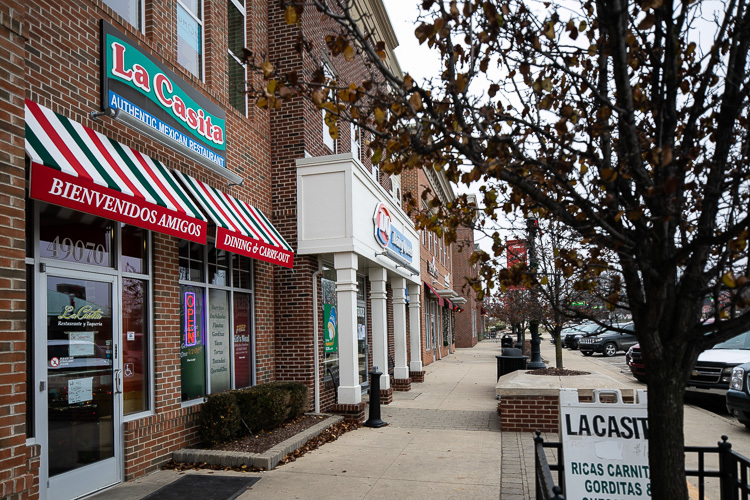 Located on Pontiac Trail, the district consists of several independent businesses such as Buttercream Bakeshop, Volare Ristorante, and the Drafting Table Brewing Company. However, Economic and Community Development Director Debra Barker believes Wixom is on the verge of a comeback. Unlike Auburn Hills and Troy, Wixom had a historical downtown in the early 1900s, says Barker. Yet two fires in December 1925 destroyed much of the commercial district and the then-village overall. Things seemed to be moving upward in the early 2000s when the city approved a mixed-use development called the Village Center of Wixom that would have included single-family homes and condos, retail, and restaurants on Pontiac Trail and Wixom Rd. However, the project was scrapped when the 2008 recession hit. Debra Barker. Photo by David Lewinski. But the city is starting to become popular to developers again. Barker says one of the reasons is due to Wixom being a part of the Main Street Oakland County initiative. The program assists city governments with improving their commercial centers while working to preserve historical landmarks. The other reason is the revamping of the Downtown Development Authority board, which Barker says is made up of young business owners and residents. 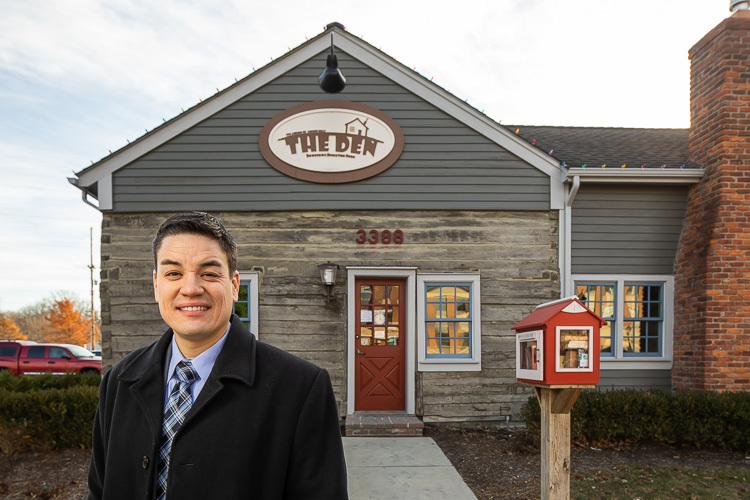 In turn, the new DDA board are creating events that will bring residents and non-residents alike to Downtown Wixom. Every May, the city hosts a 5k and 10k run called Wixom Derby Day, and in September, the Wixom Downtown Block Party. Taking place on Pontiac Trail, the event features music, food, and games. At this year’s party, the Detroit Institute of Arts featured a mobile, interactive classroom called DIA Away: Think Like an Artist. Recent events include a tree lighting festival and a holiday lights contest. In addition to creating more activities for the community, the city is also focusing on developing housing in the area. Currently, in development, housing complex Anthem at Tribute consists of two, three, and four bedroom single-family homes. The development will also include two and three bedroom townhomes called Liberty at Tribute. Located off of Pontiac Trail, the complex is set to be completed in early 2019. Two other housing projects are in the works, but they have not been approved yet, says Barker. To get new and old residents to explore the downtown and the rest of the city, Wixom is a part of the newly formed Michigan Air Line Trail. According to the Oakland Press, the Commerce, Walled Lake, and Wixom Trailway Management Council purchased the property of the former Michigan Air Line Railway last year to transform into a walking and biking pathway. The trail would run east to west from Haggerty Road to Old Plank Road, including running through Downtown Wixom. Phase one of the 7.65-long pathway from Haggerty Road to Wixom Road is set to be completed in the spring of next year, while phase two is slated to be finished by 2020. The Michigan Air Line Trail will be a part of the Great Lake-to-Lake Trail, which will stretch from Lake Michigan to Port Huron when completed next year. Read more articles by Micah Walker. Micah Walker is a Metro Detroit-based journalist.